The father-in-law was here, the father-in-law was here! Easter weekend was spent with my in-laws at our house. They were nice enough to fly down for the extended weekend and help us with some house projects! The husband and my father-in-law spent time switching out FOUR fixtures, two receptacles, and fixed a toilet! It was so motivating to have them here; it made me want to do even more! 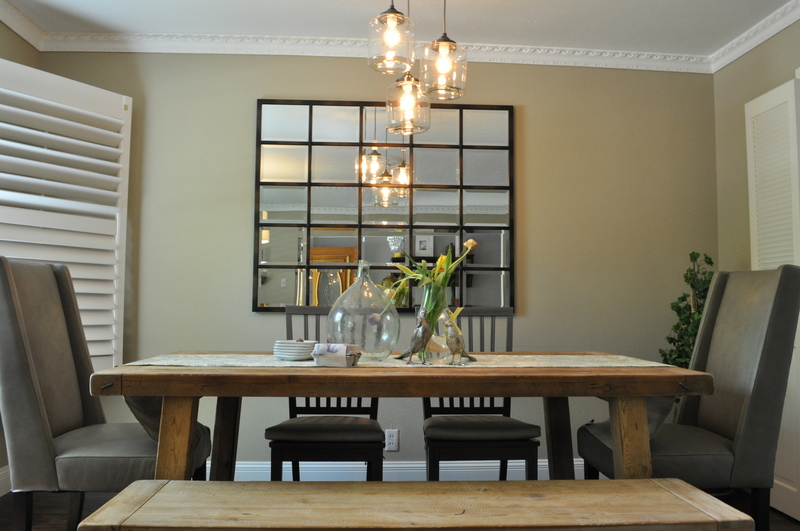 The first fixture in the dining room was probably the hardest. They had to head up to the attic because I wanted them to place a fixture directly above the dining table and get rid of the center chandelier in the middle of the room. 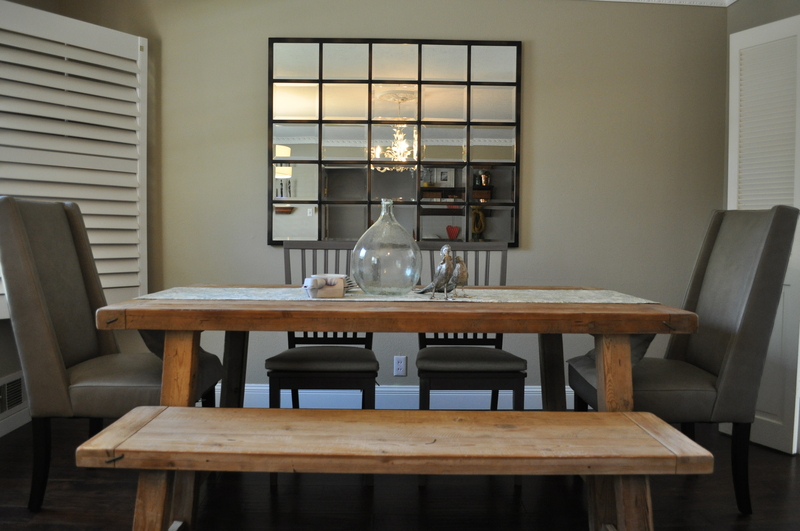 Now the space serves as both a living room and dining room instead of one big dining room. 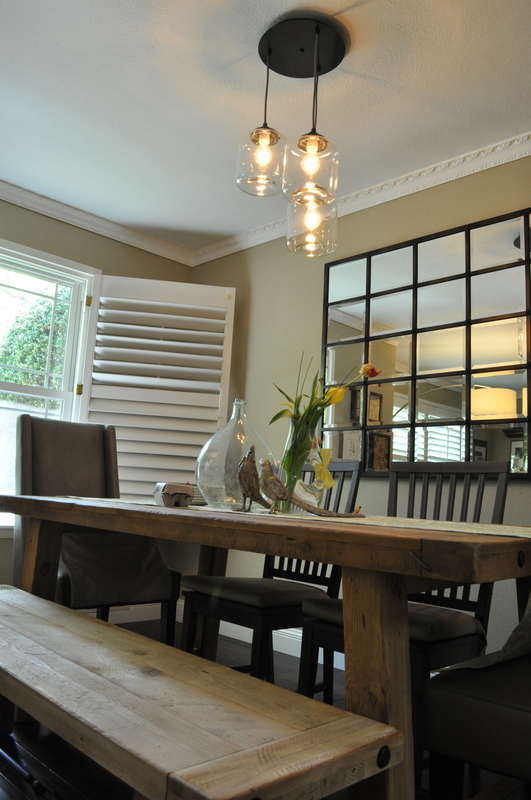 Below you can see the old chandelier in the middle of the room, reflected in the mirror. 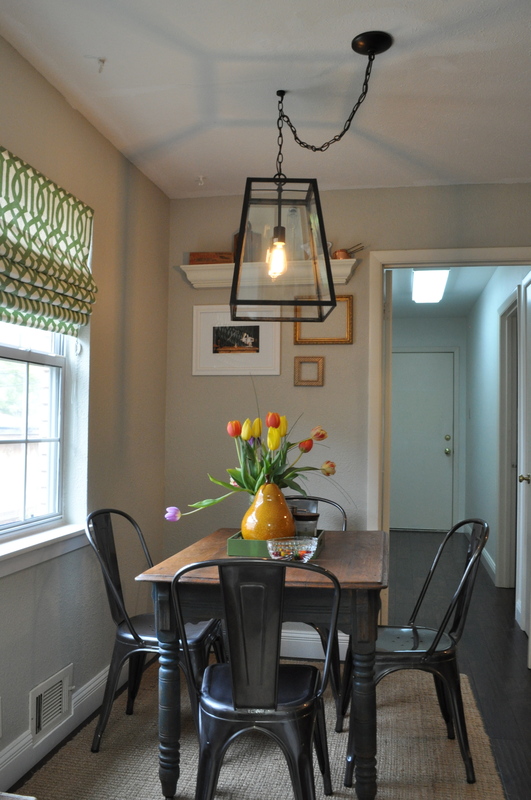 I chose a 3-jar chandelier I got from West Elm (go figure). It worked perfect in the space. It doesn’t look too formal for the table, and I’m so pleased with the size! Then, the pair moved on to the kitchen. 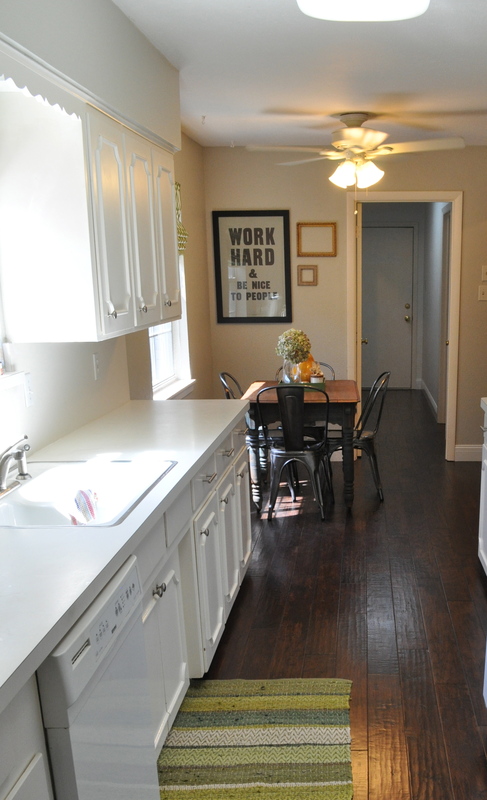 In our little kitchen nook, there was a big ceiling fan, which was nice, but I want the space to have a more structured spot for eating and entertaining. Plus the big ceiling fan wasn’t that aesthetically pleasing. I decided on Ballard‘s Eldridge Pendant. I kept the existing placement of the electrical box (the guys were happy about that) but had them swing the chain to center the light over our little farm table. 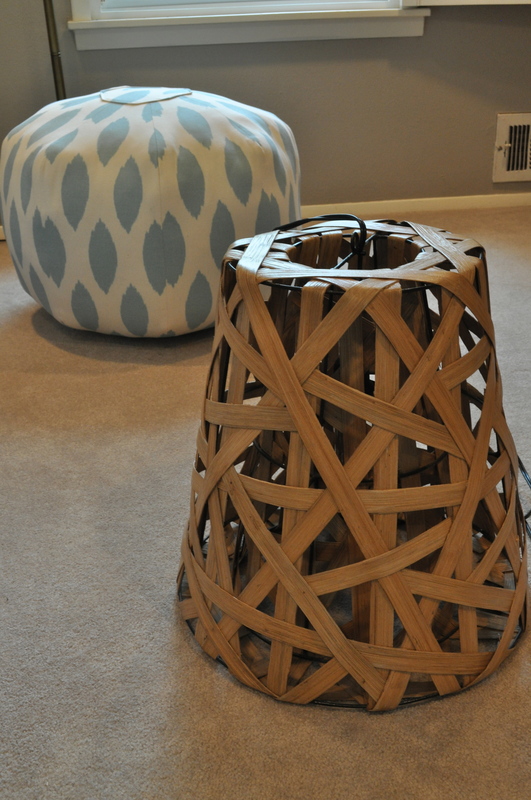 At first, I was a little nervous I got too big of a fixture for such a small space, but as I look at it daily, it really works with the space. If that wasn’t enough, they moved to the nursery. There was a very dated fan in the nursery that needed to go!! I wanted some sort of chandlier or pendant for this space depending on if it was a girl or a boy. With a boy in my belly, I went with Serena & Lily‘s Birds Nest Hanging Pendant which my father-in-law affectionately called the waste basket. 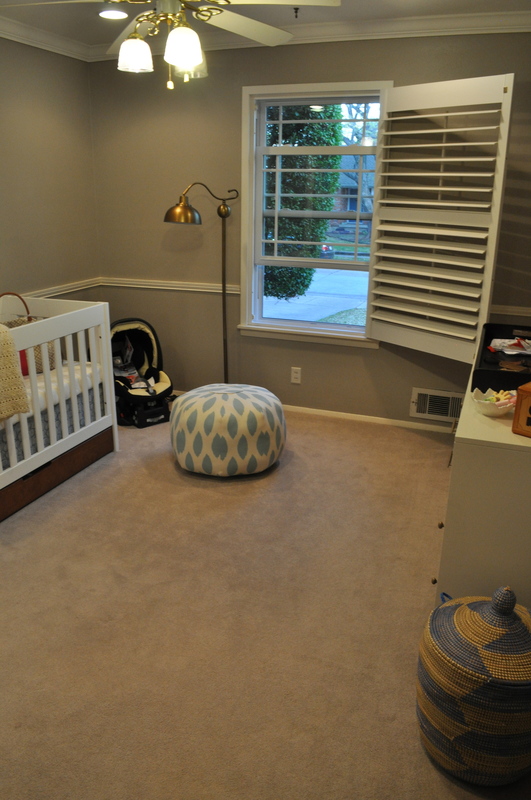 Here’s the before picture of the nursery. 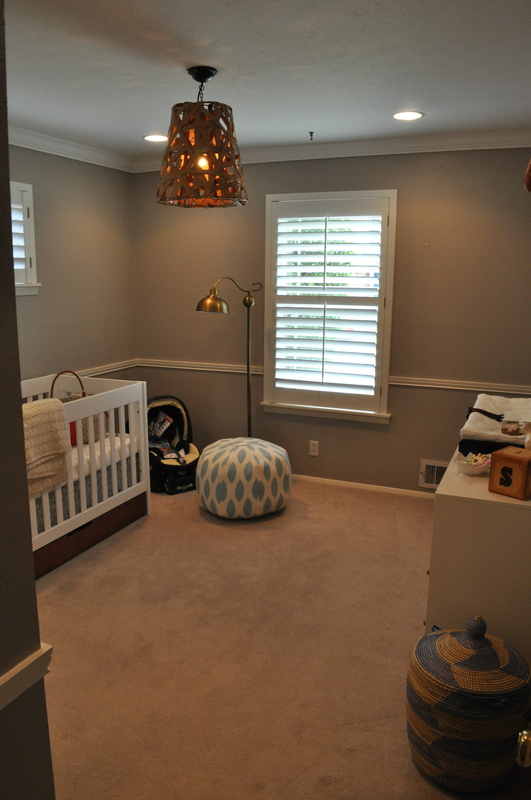 And the nursery light after! I’m in love with the nursery light, and at night it makes a wonderful design on the ceiling! Again, I was worried about how big it was for the space but it worked perfectly! I absolutely love it! I think it looks a little more boy-oriented and again love the wooden look that accents the wood on the crib and the woods on the dresser! 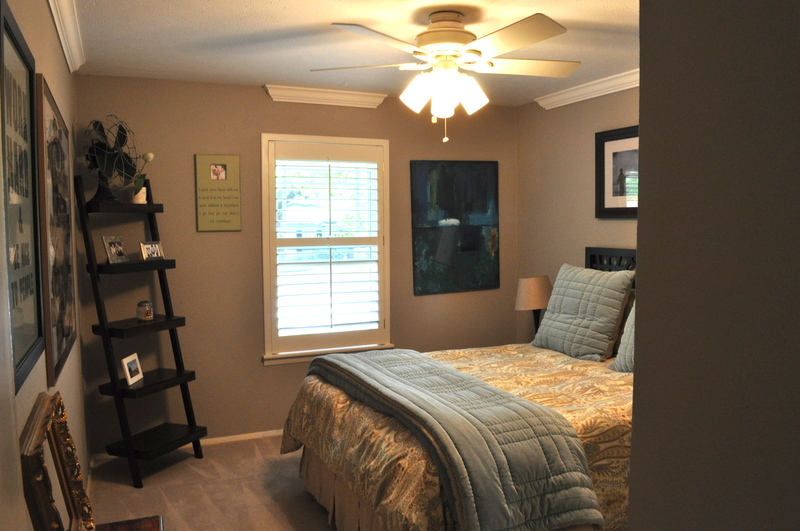 Lastly, we used our white kitchen fan to replace the current light in the guest room. 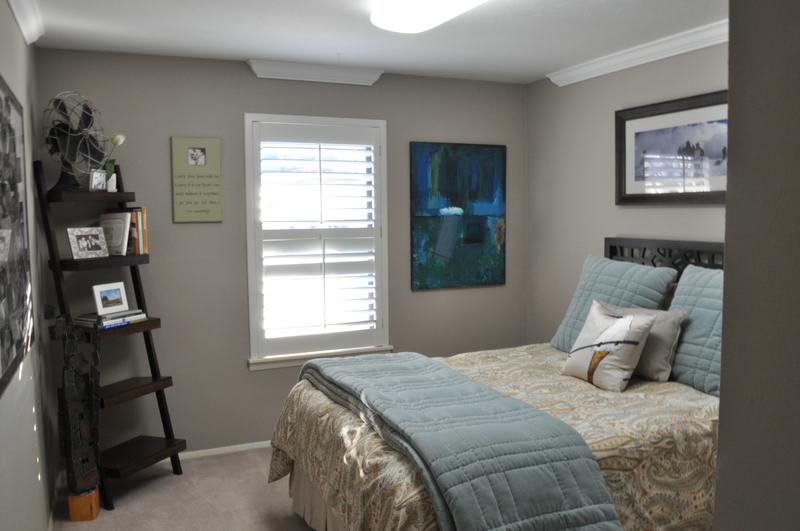 The guest room had a fluorescent light in the room from the previous owners who used the space as an office. All I had to do was clean up the fan, and I bought four new light globes for the fan to make it a little more modern. It felt good to reuse the light and get the old nasty fluorescent out! It’s absolutely awesome to have that all off the to do list and all those lights off the ground and in there spots! I’m so thankful no one electrocuted themselves or fell through the ceiling! 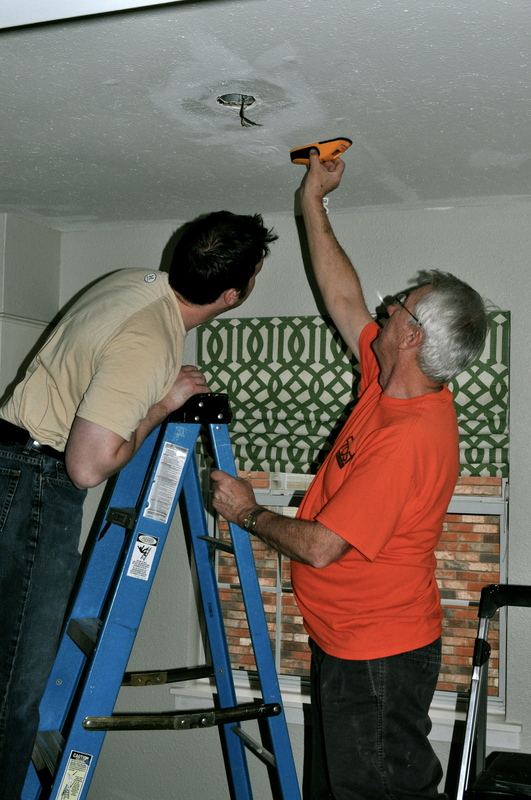 A big thanks to the husband and father-in-law for your extended efforts and work throughout the weekend! Just wanted to let you know that you really do have an awesome father-in-law!!! Hi, is that the large or medium Ballard light? Looks great! Medium! Thanks for reading!! Hope that helps!